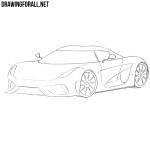 The team of artists of drawingforall.net has already created a lesson about how to draw Lamborghini, which is very popular among our readers. But many of our readers said that this lesson is too complicated, and asked us to create a simple guide about how to draw Lamborghini easy. Our team considered everything and tried to make this lesson as simple as possible. We have divided this lesson into eight very simple steps, consisting of elementary lines. To begin with, let’s say that we will show how to sketch this crazy supercar on the example of the cool and furious Lamborghini Huracan. So let’s create the outlines of the body (you should get such a wedge-shaped geometric figure). At the step number two we start adding the most general details to our cool Lamborghini drawing. Sketch out the sharp and angular headlights, contours of the windows and wheels of our supercar. Our drawing starts to look like a car. Continue drawing the Lamborghini and add some details and sketch out the outlines of the grille, mirrors and door of our cool Lamborghini. Sketch out the contours of the wheel arches, make the wheels voluminous and sketch the outline of the rims. Using clear and dark lines draw out the contours of the bumper and bonnet (or hood). Draw out the headlights, remove the guidelines from the front of our cool cool super car and draw a logo in the center of the hood. Continue the outlines of the hood and gently draw the flat roof, which smoothly passes into the rear of our sports automobile. Next, draw out the contours of windows and mirrors. To make the lines cleaner, let’s remove the guidelines from the top of out cool sports car. Continuing the lines of windows draw out the wide door and a handle on the door. Next, draw the lower edge of the Lamborghini and remove all unnecessary guidelines from the drawing. Let’s move on to the wheels of our Lamborghini now. 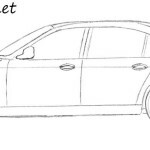 Draw out the outlines of wheel arches, wheels and rims of our car. Try to make the lines clearer and smoother. To draw rims, we first draw their central part. Then draw the spokes of the rims that go from the center to the edges. The rims can be either as in our example, or in any other style. Of course, there is nothing better than a ride at breakneck speed on the autobahn on this beautiful car, but we believe that drawing such crazy sports cars as a Lamborghini is no less a pleasure than driving it. After all, the Lamborghini begins not with driving, and not even with the process of creating a specific car at the factory, but with a drawing of the future masterpiece of the automobile industry on a piece of paper. 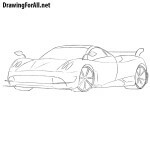 We hope our new lesson about how to draw Lamborghini easy was useful to all our readers. And as you understand, this lesson is a kind of basic manual, using which you can draw any other model of this legendary company. 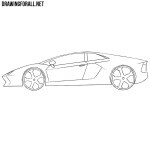 Below we have presented a few examples of how Lamborghini can be drawn using this drawing lesson. We also hope that now all our readers, even aspiring artists will be able to draw such cool cars as a Ferrari or Lamborghini. 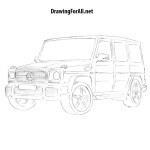 Also recall, that if you really want to learn how to draw other vehicles, then visit our category “Cars” on drawingforall.net where you will find many tutorials on how to draw cars for beginners.